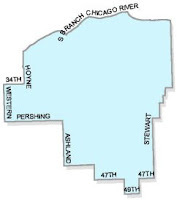 The 11th Ward as most of us Chicagoans know is the home base of the Daley family and beyond the Daley family it is also known as the cradle for mayor as many Mayors from Edward J. Kelly from the 1930s to Richard J. Daley and his son Richard M. Daley. It looks like even that ward which largely consists of Bridgeport wasn't immune to the ward remap. The Chicago Sun-Times reported earlier this week that the Black Caucus has drafted a new ward map that preserves 18 of 19 black wards in a way that would have been unthinkable during Richard M. Daley’s 22-year reign. The 11th Ward, cradle of Chicago mayors and political power base of the Daley family, would lose nearly 60 percent of its current population, including Canaryville and McKinley Park. Instead of a near equal mix of whites, Hispanics and Asian-Americans, the new 11th Ward would be 92 percent white. The heavy turnover would make it very difficult for Balcer to get re-elected. Daley’s brother, County Commissioner John Daley, is the 11th Ward’s Democratic committeeman. I did note that the 11th Ward is the home base of the Daley family. Yeah confirmation right there in that last paragraph. On Thursday, former Ald. Freddrenna Lyle (6th), an attorney representing the Black Caucus, denied that black aldermen had chopped up the 11th Ward because Richard M. Daley is no longer in office to protect it. “That was never a consideration. Our guy has no idea of the political dynamics of Chicago. He’s from Lansing, Michigan. All he does is sit at the computer,” Lyle said of the mapmaker hired by African-American aldermen. I wonder if this was the same guy who presented the first known draft map at the public meetings held by the City Council Black Caucus? Although one good thing is that an outsider is drawing the ward maps. At least for those of you opposed to gerrymandering. Of course many of us, including myself, still want to see what's the deal with the 6th ward as far as this remap goes. No news on when the public at large will see a map.